This YouTube Channel might make you feel a bit better. It’s called Smart Girls at the Party and stars Amy Poehler (parks & rec tv show) and lots of young girls being smart!! I just clicked on the link and it didn’t work. Poo. I’m going to go on YouTube and check it out! For some reason, this Comments Page converts the link into the YouTube ‘viewing box’ and it doesn’t work when you click on it because it’s not an actual video – it’s the playlist. I checked it out and it’s AWESOME! What a shame that it looks more ‘underground’ than mainstream. You’ll never hear about these wonderful girls, because they’re not ‘bankable’. That’s what bothers me about the girls on ‘Ellen’. 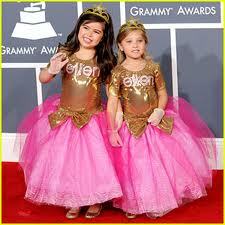 Yes I agree that it was “cute” and when Sophia Grace burst into song was a stunning moment. However the over-the-top acting (albeit normal) from this wee lass was shocking to me. She seemed so theatrical in her manner, and some would say a natural actress. But has she been conditioned to be this way? They seem to have become a ‘product’ now and it’s like the message to other little girls is you have to be over-the-top and “Super-Uber-Girly” to be noticed, regardless of your abilities or gifts. Her voice is wonderful. Yes – they’ve been conditioned now, I think.